The seasons haven’t quite turned yet, such a drag now. Thank heavens for an appearance of forced rhubarb! It always stands out at the greengrocer, I can see it a mile off. Always find myself a little bit mesmerised by the neon pink ombre of this ‘fruit’ – which I say in inverted commas because it is actually a vegetable. I can only think of rhubarb as the fruit, too many fond memories of crumble. 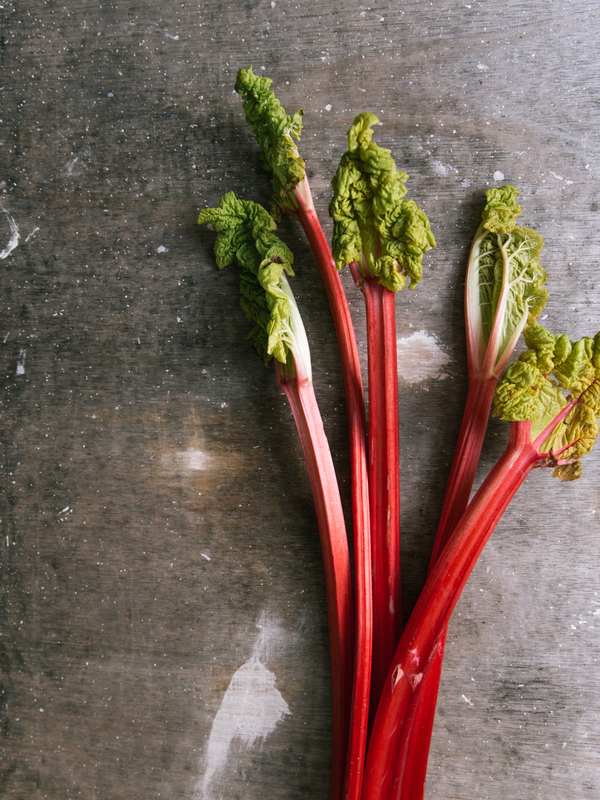 So, how do you rhubarb? I do like mine in a crumble, I mean…who doesn’t? But I do also like to rely on it at this time of year for perking up my breakfast options. Let’s opt for a porridge this time. Quite an indulgent one with the addition of honeycomb, I hope you don’t mind. I love love LOVE honeycomb in porridge, it melts a little into the hot oats, some pieces dissolving back to its syrupy state. It’s warm and comforting as all porridge should be. I’m loving the enthusiasm around porridge recently, I had it pinned as a drab peasants brekkie up until it started soaring in popularity again. There’s no denying Instagram is definitely playing a big role in that! 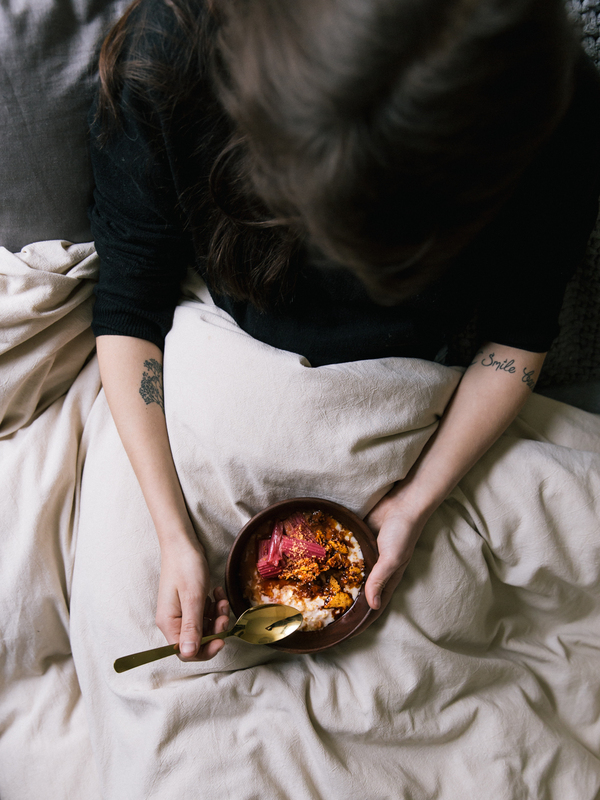 All of the photo-worthy porridge bowls are often five toppings minimum, which I’m all for when the occasion calls. This is just the two toppings, rhubarb and honeycomb. I don’t think it needs anything else. Completely delicious as it is. It’s something you can prep in advance too, the rhubarb will keep in the fridge for a couple of days and the honeycomb just as well in an airtight container. I’m sharing this over on These Four Walls with Abi, it’s our monthly seasonal recipe. Have a click through and see what she thought! I’d love to hear your ways with rhubarb too? I’m thinking of branching out beyond breakfast options for the next time I pick some up and welcome any inspiration you might have. Hope you enjoy mine for now though! 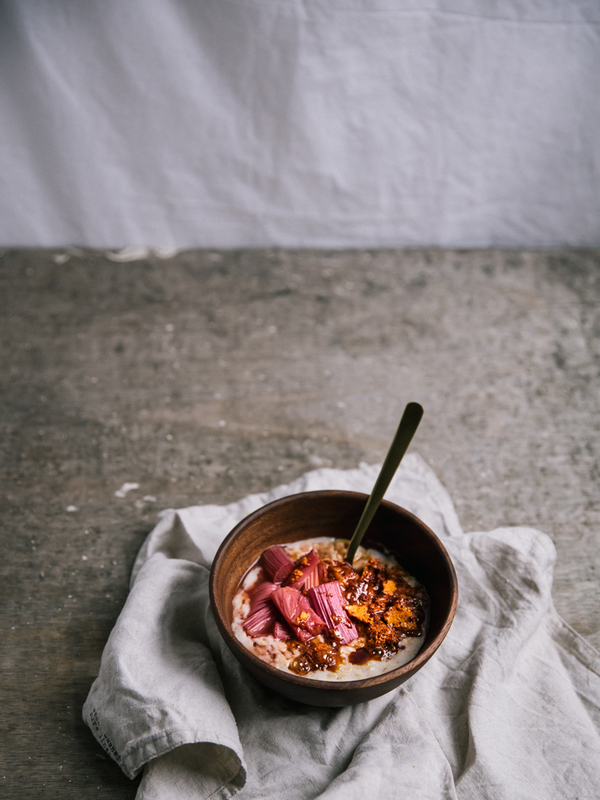 Notes on the recipe: the honeycomb will need a couple of hours to set, either make ahead for the morning or save this porridge for weekend indulgence. Heat the oven to 180 C fan/200 C/gas 6. 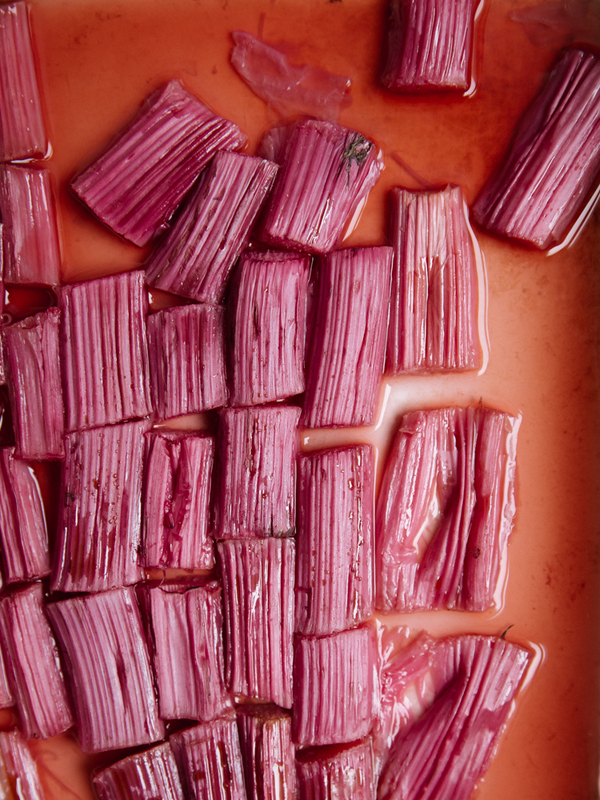 For the rhubarb, cut into short lengths and place in a single layer in a roasting tray. Sprinkle over the sugar and add a couple tablespoons of water to the tray too. Roast in the oven until soft to the point of a knife but still holding their shape, roughly 10 - 15 minutes. For the honeycomb, grease and line a cake or brownie tin. Add the caster sugar and syrup to a saucepan, place over a low heat. Stir continuously until the sugar has dissolved and there are no more grains, being careful to keep it below boiling point at this stage. When the grains have dissolved, bring to the boil and simmer for 5 - 7 minutes. When it is a rich amber colour, very quickly take off the heat and beat in the bicarbonate of soda (it should foam quite rapidly!). Pour into the tin and allow to set and cool. Allow a couple of hours for cooling time, until it is brittle. For the porridge, add the oats, milk and water to a saucepan with a pinch of salt. Stirring slowly in one direction over the heat until it reaches a low simmer, keep stirring until you've hit your preferred porridge consistency. 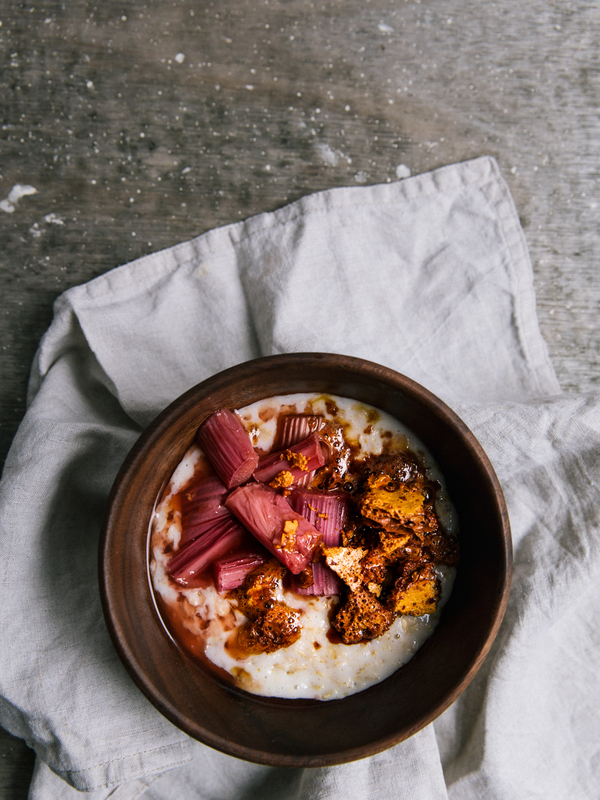 Divide between bowls, top with the rhubarb and honeycomb.